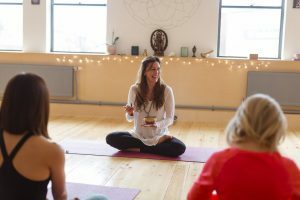 Join Roisin for a blissful Gong Bath to celebrate Yoga Kula’s 4th Birthday. We are delighted to celebrate Yoga Kula’s 4th Birthday with our loyal students and teachers on Thursday 28th July. Join us for a very special hour-long, blissful Gong Bath with Roisin from 3pm followed by some refreshing pukka tea and delicious Birthday cake. 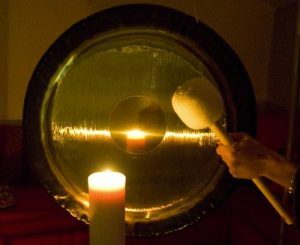 A Gong Bath is a type of sound therapy which has been used as a healing modality in the East for 1000’s of years. Bathing in the sound of the gong is said to ease stress, help remove emotional blockages and leave participants feeling relaxed and refreshed. This is our gift to you on our 4th birthday. Enjoy! In order to keep the Birthday celebrations going all afternoon we are also offering free mini massages and reflexology with Harriet from 3pm-5pm. These sessions will be approximately 15 minutes long and there is no need to book ahead – just come into the studio and pop your name on the list! To book your place at our free Gong bath class please click here. We hope you can join us to celebrate this special day.